On this site, I’ve detailed several cases of Muslim criminals, terrorist, and others using burkas and niqabs (full Muslim face veils) to try to elude law enforcement and cover up crimes. There’s the niqab cop-killer, the burka Hezbollah terrorist, and burka burka jewel thieves. Yassin Omar was captured on CCTV at Golders Green coach station in north London and at Birmingham coach station disguised in the traditional Muslim women’s dress. He was picked up on the CCTV just a day after the attempted attacks, Woolwich Crown Court was told. He was eventually arrested at a house in Birmingham by armed police on Wednesday July 27. And Muslims wonder why we object to the wearing of burkas and niqabs (full face veils) by witnesses in court, those wishing to cross our borders, and those taking driver’s license pictures. Actually, they don’t wonder. They know. They just want this behavior to continue by their burka-costumed terrorist and criminal co-religionists. Or they’d be in the streets, protesting it. Don’t hold your breath for that to ever happen. Just look at the cave-man mentality of the brain-dead in that picture. They look like the grim reaper because that’s who their “profit” was. * In the iconic movie The Battle of Algiers, about the French-Algerian war (1954-62), there’s a scene where the Algerian nationalist/terrorists hide under women’s shawls while fleeing police. Therefore it should be no surprise that terrorists wear burqas and niqabs to do their dirty deeds. 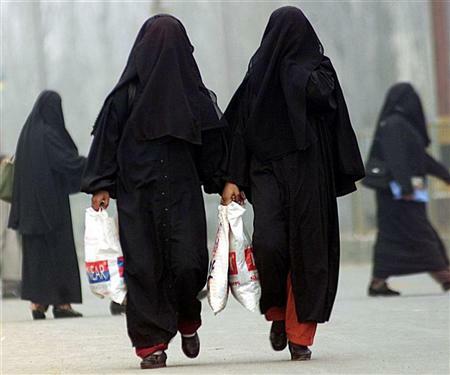 Covering your entire face in public should be absolutely prohibited. The Left wants us to “tolerate” everything. We have to stop tolerating Lieberal insanity. Lieberals should be rounded up and given a daily treatment with Thorazine suppositories. This hijab-clad Australian (actually Lebanese) woman invented a burkini [BURKA+BIKINI]. Now we’ll have them invading the beaches! For those who are following burka news, here’s a related news update about Taslima Nasreen, a courageous Bangladeshi woman living in India. She’s also one of my heroes! She’s come under fire by Indian Mozlem clerics for criticizing the burka.